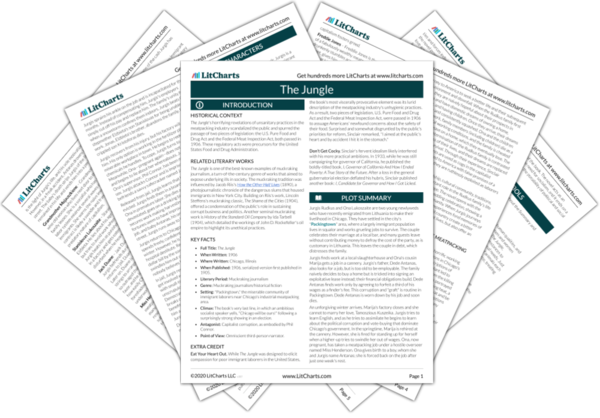 Instant downloads of all 942 LitChart PDFs (including The Jungle). 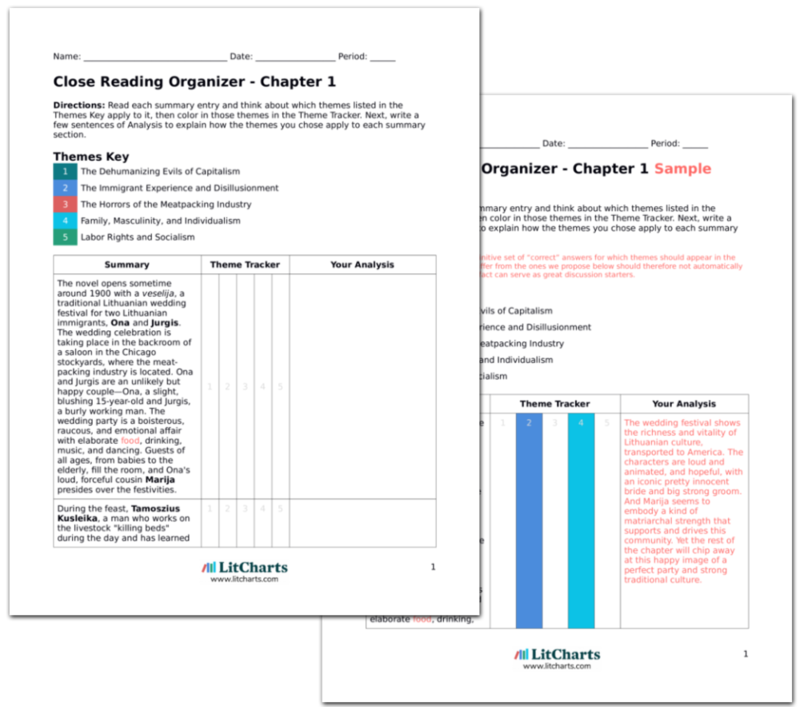 LitCharts assigns a color and icon to each theme in The Jungle, which you can use to track the themes throughout the work. As soon as Jurgis gets his job with Hinds, he goes back to the brothel to convince Marija to abandon prostitution. Marija sees no point in leaving: her drug addiction and tarnished past make her unable to perform any other work. Jurgis cannot convince her to come with him, and he leaves discouraged. Jurgis's passionate idealism is still not enough to stir Marija, who has been so broken by capitalism that she cannot imagine herself escaping it. The point seems to be that socialism must create change in order to save people like Marija before they are forced to succumb to the ravages of capitalism. Jurgis's home life is unpleasant: Elzbieta is often ill and the young boys misbehave. However, he finds solace in thoughts of Socialism. The day before the election, Jurgis is called to meet a man named Fisher, a millionaire-turned-settlement-worker who sympathizes with the socialists. At Fisher's house, Jurgis is to speak to guests, among them a prominent anti-socialist magazine editor, about the horrors of the meat industry. Also in attendance is Dr. Nicholas Schliemann, an erudite Swede who speaks eloquently and powerfully about the way institutions of government and religion oppress the workingman. Socialism motivates Jurgis to persevere, despite his unpleasant circumstances. Furthermore, his engagement at Fisher's shows that he is becoming a trusted and important member of the movement. That Fisher has become a socialist shows again how socialism cuts across class and makes allies of those who capitalism would make enemies. Another guest, a socialist preacher named Lucas, objects to Schliemann's sweeping denunciation of religion. The two argue back and forth until they are asked to summarize the principles on which they agree. This yields two fundamental tenets of socialism: that the means of production should be owned by the people and managed democratically, and that the "class-conscious political organization of the wage-earners" is the method by which this popular ownership should be established. While Lucas's and Schliemann's overall philosophies differ greatly, both believe in those two principles. Afterwards, Schliemann outlines his extensive vision for the future of mankind. He predicts that once industrial inefficiency and corruption have been reformed, labor can be automated. Men will be able to work far less, allowing them more time to develop their intellectual interests. Schliemann's and Lucas's discussion distills the essential qualities of the socialist movement while also illustrating that it can encompass a wide range of ideologies. The election takes place, and the socialist voter turnout is far greater than in previous years. Chicago, in particular, shows itself to be a socialist stronghold. Jurgis and his comrades at Hinds's hotel are overjoyed. A fiery speaker addresses Jurgis and a crowd of socialist laborers, urging them to maintain their resolve and continue organizing. If the socialists can sustain and amplify their revolutionary fervor, the speaker urges, the party can instigate overarching, meaningful change. The speech crescendos to a fierce refrain that marks the end of the book: "Chicago will be ours! Chicago will be ours! CHICAGO WILL BE OURS!" The book concludes on an encouraging—and conspicuously pro-socialist—note. The socialist movement has brought meaning to Jurgis's life in America. Moreover, only socialism has allowed Jurgis to actually change his circumstances for the better. His other acts of rebellion were ill-conceived, destructive, and often counterproductive, but the expansion of socialism shown at the book's close suggests that it may provide a genuinely constructive solution to the evils of runaway capitalism. 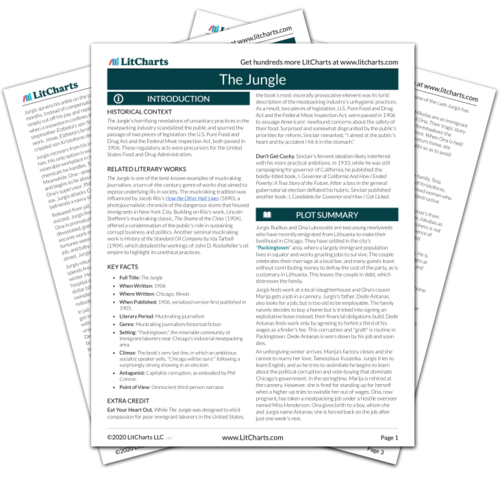 Get the entire The Jungle LitChart as a printable PDF. Sobel, Ben. "The Jungle Chapter 31." LitCharts. LitCharts LLC, 5 Jan 2014. Web. 20 Apr 2019. Sobel, Ben. "The Jungle Chapter 31." LitCharts LLC, January 5, 2014. Retrieved April 20, 2019. https://www.litcharts.com/lit/the-jungle/chapter-31.